If you want to make regular yoga practice a part of your life, there will be times to practice at home. Maybe you can’t afford to go to the yoga studio as much as you want to or your schedule is too busy to make the drive. Some people find it’s easier to support a daily practice by hitting the mat at home. Fortunately, with tons of online classes and yoga DVDs available, it’s easy to find a practice to do at home. Even if you don’t have space for your own fitness room or yoga studio, you can chatarunga in any room of your home with some essential yoga equipment. These are the five items you need to practice yoga at home and they’re a great investment for any beginners to yoga. Get the whole set to make your own home yoga kit. This may seem like a no-brainer, but a lot of people who are just starting out rent at mat from their yoga studio. If you want to practice at home, a good quality sticky mat will help you hold your poses safely. There are a variety of different types of mats in different thicknesses, colors, and designs. Your choice of a mat is very personal, but there are a few things to take into account. If you have sensitive knees, a thicker mat will help provide extra cushion. On the flip side, a thicker mat is bulkier and heavier to carry, so if you also plan on taking your mat to the studio or do yoga while traveling, you may be happier with a lighter one like these travel yoga mats. Make sure when you’re shopping that you look for non-slip mats specifically for yoga. There are plenty of exercise mats out there that are nicely cushioned but don’t have enough stickiness to keep you safely positioned in your down dog. If you tend to sweat a lot in your practice, an extra sticky mat or a yoga towel will be very helpful. A pair of yoga blocks may seem like a very simple accessory, but they are such a versatile tool for your yoga practice. Many beginners don’t even consider buying blocks, but they’re essential for modifying poses. They can also frequently be used in place of bolsters for some restorative yoga poses. When it comes to buying yoga blocks, there are tons of options for colors, materials, and sizes. We recommend getting a pair of the same size and that’s usually all you need. Look for blocks made of high-density foam or cork. They should be extremely sturdy with a slight give. I recommend picking blocks in a bright and fun color or getting a set that match your new yoga mat. A good yoga strap is a tiny piece of equipment that can make a big difference in your practice. Yoga straps are perfect for modifying poses, especially helping with stretches that are inhibited by tight muscles. I use mine frequently as an assistant for stretches because of my tight hips and legs. 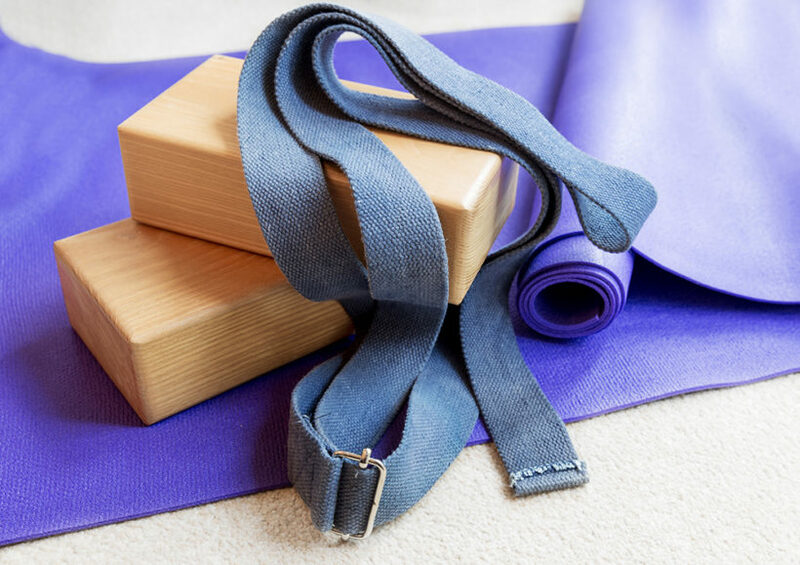 While you can use a towel or a belt as a DIY strap, having a dedicated yoga strap that you can toss in your bag when you go to class is a great bonus. When shopping for a yoga strap, I recommend longer ones that will be useful in a variety of poses. An 8 foot length is good, though if you are taller you may find a 10 foot yoga strap to be better suited. Look for a strap with some type of buckle at the end as there will be some scenarios that are useful to turn your strap into a loop. Ok, so you might be thinking, “I already have a yoga mat, what in the world do I need a yoga blanket for?” Yoga blankets are an extremely versatile item to have, especially if you have limited space for yoga gear and bolsters. A yoga blanket can be used as padding to support sensitive knees in certain poses. The blanket can also be rolled and used as a bolster for restorative poses or to modify difficult ones. Many people enjoy covering up with a yoga blanket during savasana to avoid getting cold at the end of your practice. These cozy blankets are also perfect to use instead of a meditation shawl or to cushion your knees while using a meditation bench. While almost any thin blanket can be used, a traditional Mexican blanket is most common. I bet you didn’t even consider that something as versatile as a water bottle would be on this list! Hydration is so important with any exercise. Even if the style of yoga you do doesn’t always break a sweat, you need to make sure you drink plenty of water before, during, and after your practice. If you’re doing hot yoga or otherwise find yourself drenched, hydration is even more important! Plain filtered water, infused water, and electrolyte drinks are the best bet to keep you hydrated and healthy. A sturdy water bottle is the best way to to keep water on hand while you practice. Even when I do yoga at home, I prefer to keep a water bottle next to my mat than a glass in case I accidentally knock it over! I really like this water bottle from Nalgene because it’s easy to carry to class at the studio and is also great to grab a sip in the middle of your routine. Now that you have all the equipment you need to practice yoga at home, check out the best yoga DVDs for beginners and my favorite yoga Youtube channels for free classes.